You could win this gorgeous girls pink silk pillow or pick from over 120 handmade pillows from the collections at PillowthrowDecor just by signing in as a reader by using the subscribe button or following as a Google friend (both in the right column). Leave a comment or even 2! Congratulations to GalleriaLinda– last week’s Pillow Giveaway 7 Pillow Winne r! Be subscribed as a follower or reader visit PillowThrowDecor on icraft or on Etsy and tell me which pillow you would like to win by pasting the link here or describe it in this post here. For a second entry tell us what Pillow Size you prefer most…. Example 20 x 20″, 12 x 12, or 12 x 18, whatever size or shape. I’ll be posting some MORE new handmade pillows in the store this week so check back frequently to see the updates! This week’s draw date will be Friday evening August 13. All entries will be submitted for the big summer end draw so keep entering! 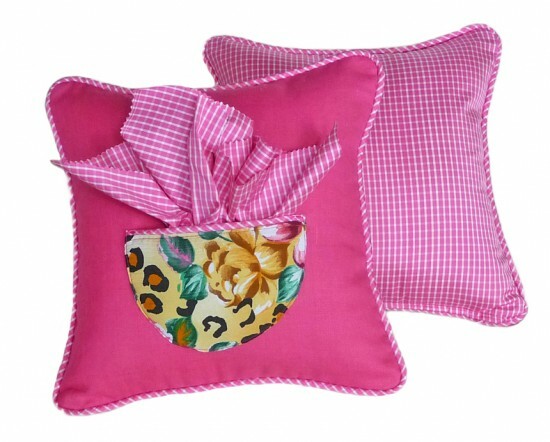 You make fabulous handbags… does that mean you sew pillows too? Feel free to come back here and post a link to your store. Just listed that pillow cover today and am adding some co-ordinates to it. thanks so much for being a PTD reader! Hi Gina… their has been such a run on the black and white stripe pillows I am down to these last two. Checking my suppliers for more of this fabric but it looks like there’s a run on it everywhere. I’ll keep looking though! Thanks so much for stopping by. The perfect size to me is 20×20. Hi Lubaska! Since you are from Europe may I ask you if you prefer feather or fiberfill pillows? this is my favorite size for sofa pillows. where would you put ones this size? Where do you put pillows this size? Is shabby chic still big into ruffles? You’re right about squared shapes… even the round bolsters have been squared up as a 9″ wide and often 26″ long. Keep entering… all comments go into the big bucket for Summer end’s draw. Next post: Feather or Fiberfill Inserts for Throw Pillows? Previous post: Pillow Fairies Missing – Have you seen them?